Emeritus mathematics professor Joseph Taylor passed away on July 28, 2016, at the age of 75. Colleagues, family and friends gathered to commemorate his life at a memorial service on Aug. 3 in the Cowles building loft. Taylor, who also served as mathematics department chair, dean of the College of Science and senior vice president for academic affairs was remembered as a brilliant mathematician, an insightful leader and a loyal friend. Taylor was born in 1941 and grew up in Salt Lake City, graduating from Olympus High School in 1959. He enrolled in his first math classes at the U in the fall of 1960, but decided to leave Salt Lake the following summer. Recognizing Taylor’s talent, U math professor Don Tucker helped him enroll at Louisiana State University at the graduate level in the fall of 1961. By the next year, Taylor had been offered a junior faculty position at Harvard University based on a well-received thesis. To fulfill Harvard’s hiring requirements, Taylor finished his bachelor’s degree in December 1963 and was awarded his doctorate the following spring. After a year at Harvard, Taylor returned to the University of Utah. 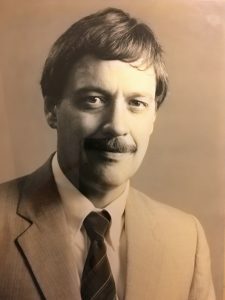 “From taking his first college math classes in the fall of 1960, to returning as a faculty member and leading mathematician in the fall of 1965 — it was a remarkable few years,” said mathematics department chair Peter Trapa. Taylor worked to strengthen the math department through hiring top mathematicians, transforming the small, regional department into “a center for research excellence,” in Trapa’s words. Taylor’s graduate work focused on harmonic analysis, a vast generalization of the “harmonics” arising in a vibrating string, and developed a far-reaching theory of “measure algebras.” His work was awarded the 1975 Leroy P. Steele prize. He also applied tools from one field of math to another, using aspects of a field called sheaf theory to solve long-standing problems in another field. “It is one of the essential tools of analysis,” Rossi said. “At the time, it was alien to the subject.” Other mathematical accomplishments included a significant counter-example in the field of topology, a tool called the “Taylor spectrum” in operator theory, and contributions to the Riemann-Hilbert correspondence in representation theory. As department chair, dean and senior vice president, Taylor applied his focused, clear mathematical thinking to university administration. “He was a fantastic mathematician – one of the best. But he was also a great leader and possessed great clarity of thought.” After 47 years at the U, Taylor retired in 2012. “He was very intensely loyal to his family and friends,” Rossi said. Rossi fondly recalled joint family trips camping and hiking in the Taylor’s beloved outdoors.